I’ve reviewed more than a few Transcend storage devices already from an internal SSD with the SSD230S to an external one with the 25C3N HDD, I even tore some apart to check the internals of the Storejets like the 25H3. I haven’t had any issues with their storage devices and for the most part, all of my thoughts are positive regarding their products. 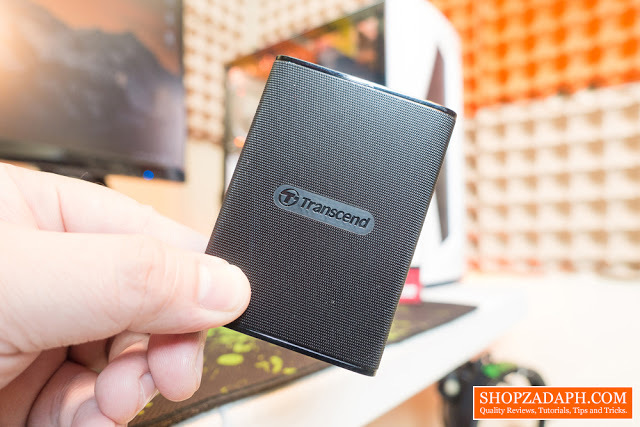 Hopefully, that will not change with the one we have today, which is the Transcend ESD220C, a promising fast and compact external storage device. Aside from the Transcend ESD220C SSD itself, we have inside the package a USB Type C to USB Type A cable. This is nice but it would have been better if there’s also an included USB Type C to Type C cable to take advantage of the OTG support for this drive. Anyways, we also have the quick start guide, A warranty card, And some other paper works. In terms of design and construction, I have mixed feelings with this, on one hand, since it’s made of plastic, it’s extremely lightweight at around 35g and with its size of 77 mm x 55.7 mm x 9.6 mm, it’s super compact and portable. But on the other hand, I feel like an aluminum casing would have been better so that you can toss it around inside your bag, pocket, wallet and whatnot without having to worry about it as you go along with your day, since most of the time you’re probably going to bring this along with you. The overall design of the Transcend ESD220C is ok, it has this textured pattern on the enclosure that will certainly help with the grip, although on the downside, it is also possible to have dirt stuck in it. Moving on, we have the transcend logo at the center. And at the back, we have the same textured pattern and some technical information about the product like the model and serial number, as well as the country where this is made from, which for our sample, is made in Taiwan. At the front side, we have the USB Type C port as well as the “One-Touch” back up button. 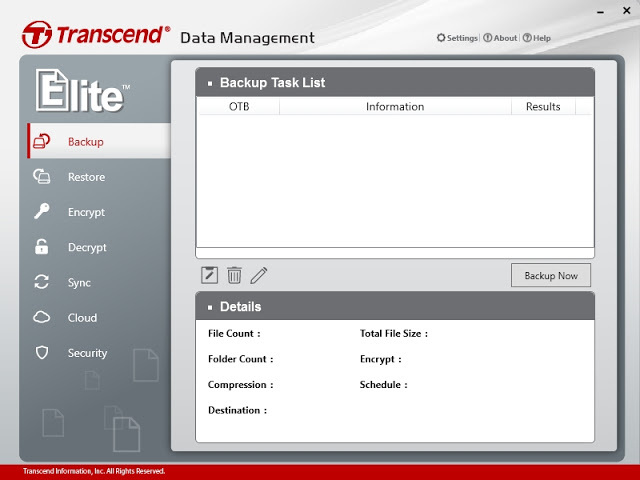 You can use the One-Touch back up button alongside the Transcend Elite software to instantly back up your files. 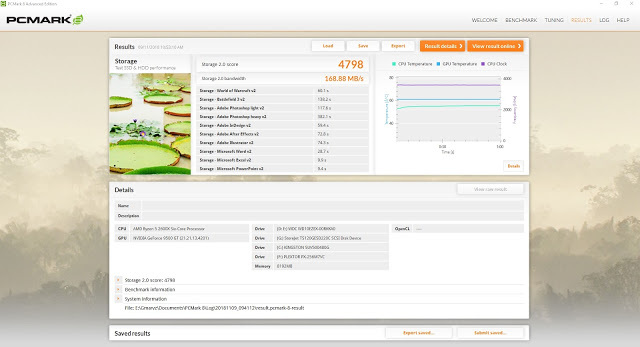 Before we proceed with the performance benchmarks, let’s talk about Transcend Software. In order to take advantage of the “One-Touch” Backup button, you need to install the Transcend Elite Software which you can download here. Inside the software, you can easily setup tasks such as back up files, conduct file restoration, data encryption, and decryption, file sync and back up your files to cloud storage such as Dropbox and Google drive. Aside from the Transcend Elite software, you can also opt to download other Transcend software such as the RecoveRX to recover deleted files, SSD scope to check your SSD’s information and other available software as seen below. 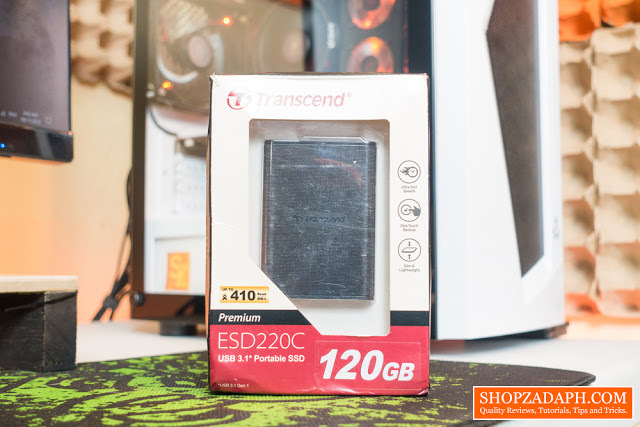 The Transcend ESD220C is rated at 410MB/s Read and 400MB/s Write, it’s not as fast as other internal SSDs out there but it’s still far more superior compared to a mechanical hard drive. It uses 3D Nand Flash but I can’t find what specific controller they are using for this particular model. So looking at our CrystalDiskMark benchmarks, the Transcend ESD220C easily topped that rated speed at 463MB/s Read and 417MB/s Write. Comparing it to one of my mechanical hard drive here that’s inside a USB 3.0 enclosure, the difference in speed is night and day which is pretty much what we can expect from an SSD. I’ve also tested it on AS SSD Benchmark, which is another benchmarking tool that tests an SSD without using the system cache. 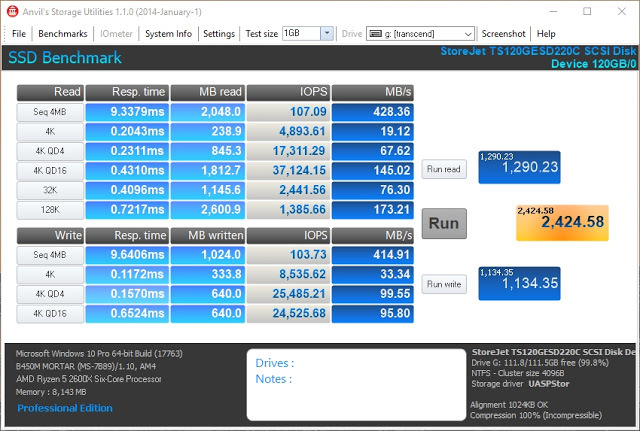 Again the Transcend ESD220C topped the rated speed at 436MB/s Read and 426MB/s Write. While we’re at it, I also ran this through Anvil’s Storage Utilities which got us a 428MB/s Read and 414MB/s Write which is still right around the corner of what we’ve been getting so far from the Transcend ESD220C. 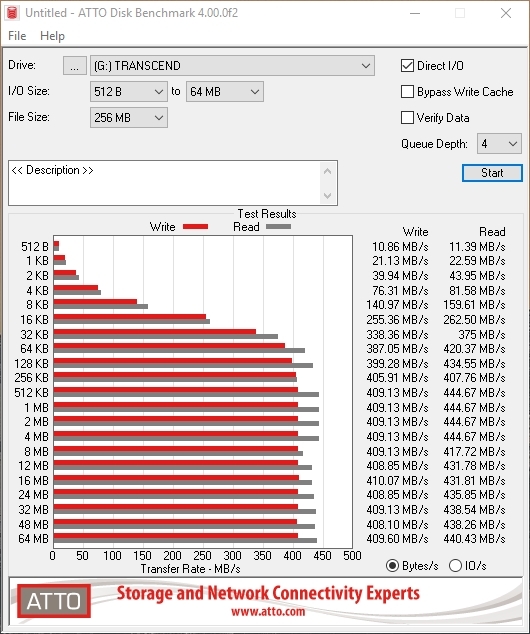 I also tested this in ATTO Disk Benchmark tool to see the performance of the Transcend ESD220C in different file transfer sizes ranging from a small 512B to 64MB file. I also tested the Transcend ESD220C using PCMark8’s Storage benchmark to test its real-world performance on various applications and games. The score is decent, again it’s not as fast as an internal SSD but it’s still pretty fast nonetheless. And lastly, to test the real world performance of this portable SSD, I used the tool called disk bench, which simulates a real-world file transfer and accurately record the number of files copied, the total size, the time to finish the transfer and the transfer rate throughout the process. So during the read operation, to which I transferred files from the Transcend ESD220C to my desktop PC that runs on a Kingston UV500 SSD, we’ve got an average transfer rate of 188.738MB/s which is pretty good considering this is a portable device. While during the write operation, where I transferred files from my Desktop PC onto the Transcend ESD220C, we’ve got an average transfer speed of 75.245MB/s. It’s a little bit slower but that’s to be expected when it comes to the write speed in comparison with the read speed. 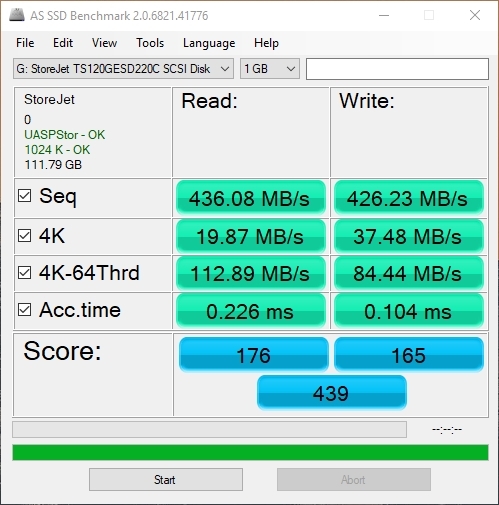 Overall, the performance of the Transcend ESD220C is decent, it’s not over the top or exceptional compared to other SSDs but it gets the job done. Alright, so to conclude, what I like about the Transcend ESD220C is its very compact form factor. Having a USB Type C port and a Nand flash storage made this portable form factor possible. I just wish the enclosure would have been aluminum or something more durable than plastic, but I guess it’s being lightweight and compact more than made up for that. I also wish that since this supports OTG functionality with other devices such as smartphones that they should have included a USB Type C to Type C cable or at least an adapter. The performance is ok, nothing exceptional to write home about but as I’ve mentioned, it’s still way better than the traditional mechanical hard drive and it surely gets the job done.